NetBet Sports is giving out a limited time Australian Open Free Bet Offer that can see you scoop 2x €5 Free Bet during the first Grand Slam tournament of 2017! Game, set, match! Place a €30 wager on the hottest tennis action in the Land Down Under, and you’ll receive a cool Australian Open Free Bet of €5 on two occasions during the tournament. Only pre-match bets apply towards the Australian Open Free Bet. The first set of the Australian Open Free Bet is open until January 22 – make sure you place bets on 3 tennis matches until the of this period to qualify for the first €5 Free Bet. But don’t forget about the second €5 Free Bet offer that’s valid between January 22 and January 27 – once again bet on 3 matches to collect your second Australian Open Free Bet. NOTE: Free Bet 1 can be used for the first five days after being credited to your account (January 23), while Free Bet 2 is valid only for the final only after you receive it (January 28). Invest wisely and invest quickly with Australian Open Free Bet. Novak Djokovic has won the tournament on a total of six occasions, which includes him lifting the trophy on the last two editions of the Australian Open. This is the main reason why he’s the favourite to win it again this year 2.50 (6/4), despite suffering a dip in for throughout certain periods last year. Andy Murray remains the underdog 2.55 (31/20) for the competition, while all the others are heavy outsiders. Serena Williams – who also won the Australian Open a whopping six times – suffered a loss in the final against Angelique Kerber last season, but the American remain the favourite to lift the trophy this season with odds of 3.75 (11/4). The German star, on the other hand, is right behind her on the chart 4.50 (7/2), while Karolina Pliskova is third favourite 7.00 (6/1). 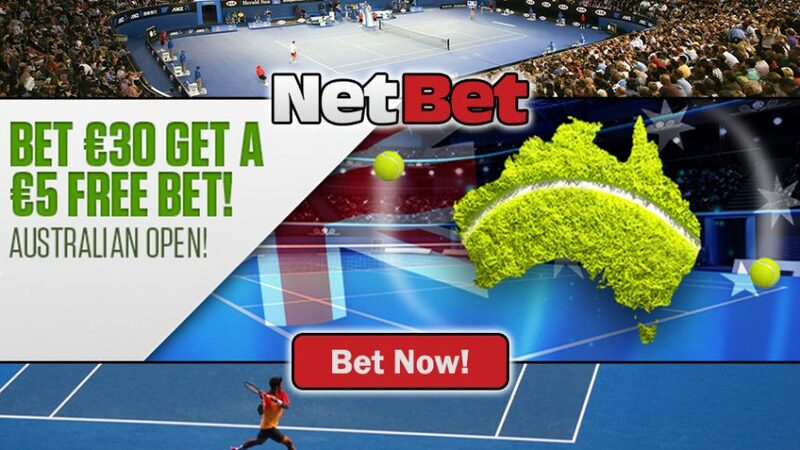 Join NetBet Sports today and bet €30 on the best tennis matches to get €5 Free Bet on two occasions with the lucrative Australian Open Free Bet Offer! Maximize your earnings with Australian Open Free Bet!